I wanted to see what happened if I submitted a blog entry with pictures by email. Is it clever enough to do something sensible with the attachments? It’d be nice if it at least did a basic layout, which could then be edited later. The picture? 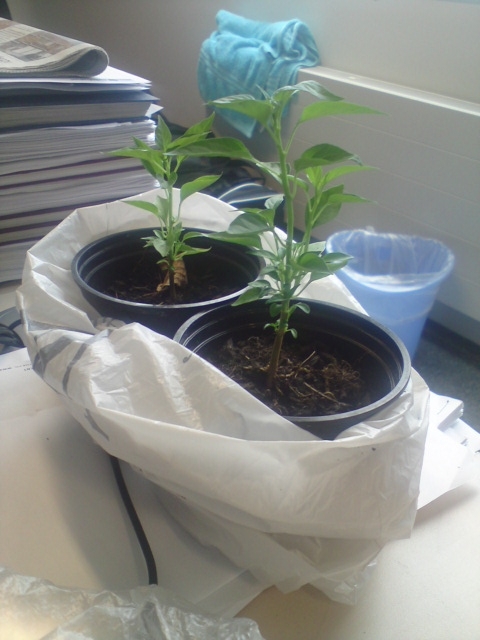 That’s a couple of Hungarian chilli plants (I’m not sure of the exact variety), which are sitting on my desk at work, waiting for me to figure out how to carry them home in a tank bag without trashing them. Answers on the back of a postcard, please.